Q. Should I paint my shingles or leave them natural? A. Hmmm… A lot of people like to paint shingles, because then they will blend into or enhance a color scheme. I've seen beautiful cedar roofs that are blue, and green, or even red. Even I, purist that I am, had a hankering to go green -- once! However, during that time of hankering, the love of my life cleared her throat and gave me "THE EYE." I am very afraid o "THE EYE." She reminded me that one needs to repaint painted shingles about every seven years. She also reminded me that it would be me doing that painting. I quickly calculated how many seven-year cycles were most likely left to me, and I re-considered. The incredible, beautiful thing about white cedar, you see, is that it ages to a nice silver-gray - a lovely patina. Another incredible thing about white cedar is that it ages without curling, cupping, or cracking! It's been a long time since I fought the temptation to paint. It would have looked wonderful, but now, as I look at my beautiful silver roof, I am pleased. Just like us, our shingles are proudly silver-gray. Unlike us, they show no signs of curling, cupping or cracking up! Q. If I paint, what is the best and easiest way to accomplish that? A. I need to tell you that the easiest and best way to paint or stain shingles is to simply have us do it for you. Unless, of course, you enjoy making messes, and getting covered in pretty ink stains and colors for a long, long time that may or may not complement your skin tone. If we do it for you, we will hand dip each shingle, one at a time and then let each of them dry about five minutes in a vinyl rain gutter, just to let the excess color run off and drip into a bucket to be reused. Then, we will hang each of your beautiful shingles with a clothespin on a line for eight hours to dry (latex), or longer (especially for oil-based colors). Our process is a bit cumbersome, but, everything worthwhile is, I have learned. There are no shortcuts to greatness, nor quick courses to wisdom, and art makes its own schedule, indeed. Q. What kind of nails or staples work best to attach shingles? A. The short answer is: we recommend either double-dipped galvanized, or stainless steel nails between 1 1/4 and 2 inches long. A better, more informed answer needs to include some little-known information as well. We sell Maze nails made in Peru, Illinois, which are especially made only for cedar shingles. (Our Maze nails should not be confused with maize nails, which are a bit corny!) The Maze nails we sell also carry a specialty brand of air staples for shingles. Q. What do you put under the shingles on roofs or sidewalls? A. Roofs are physically and psychologically the barriers between the elements and what's important to protect. Someone once asked me, "If you can't provide a roof, what good are you?" and I have never found an answer to that question. Never underestimate the importance of a strong, safe, and powerful roof. Therefore, anytime you put a shingle on a roof the preparation is very vital. The shingle and the roof will need to merge and act like one mighty shield for a long time, impervious to the ravages of rain, wind, hail, ducks, bugs, and mold. The truth is, the natural enemies of roofs include acts of god, and bugs and mold. We can do our best to protect ourselves against the mighty winds with good fasteners and great shingles. But the bugs and mold, well they need a different kind of thinking. I like to think that we can be smarter than little squishy bugs and craftier than plants, and I have found a couple of ways that do outsmart the little organisms, at least for a hundred years or so. Q. Continued: What do you put under the shingles on roofs or sidewalls? A. I believe in furring strips, and Cedar Breather. I like to put down furring strips horizontally for each row of shingles. This natural solution is inexpensive and effectively lets the shingle breathe to prevent mold and rot. And, the strips give depth and character to the construction. Cedar Breather, manufactured by Benjamin Obdyke, can also be used to accomplish mold and rot protection. it costs about $55@sq. and comes in rolls that each cover 200 sq ft. I have personally seen many roofs covered with eastern white cedar shingles that were put down over 100 years ago with furring strips and are in great shape today! I have seen other roofs put down 15 years ago without furring strips that are already in need of replacement. Dang, you'd think they would know better! In my experience over the last 20 years of manufacturing both white and red cedar shingles, white cedar outlasts red cedar by far. This fact holds true, of course, when they were both put down in a quality manner, by quality folk, using quality fasteners, and furring strips, and reverence for the responsibility. Sidewalls, though important, just simply do not shoulder the responsibility, either physically or psychologically as does the roof. No one ever asked me "If you can't provide a sidewall, what good are you?" Tyveck or even old fashioned tar paper is just fine for a base prior to laying your shingles. Q. 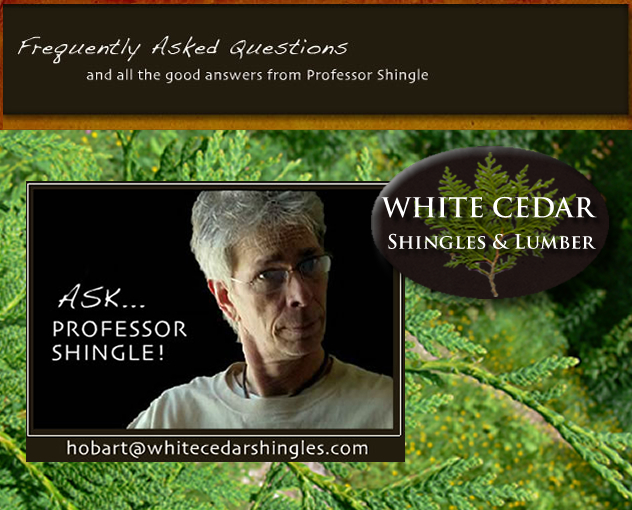 Why is white cedar so much more environmentally beneficial than red cedar? A. Ahhh, grasshoppers, the answer to this question is as simple as this: The Red cedar of legend, wonderful, strong and straight, exists today only in endangered forests that sprung from the earth long, long, ago. Unfortunately, the Red Cedar used in many products today, is cut from third, fourth and fifth generation red cedar trees that (well, to put it gently) don't quite have the strong, true, and noble characteristics of their ancestors. White cedar, however, has the genetics, or pure force of will, to stay true to old growth potential. In other words, third, fourth and fifth generation White Cedar maintains the attributes of the original forests of old. There is a scientific explanation for the capacity of white cedar to be true to its strengths generation after generation, but I prefer to think of it instead in terms of life force, or vibrancy. White cedar has it. red cedar is fading. We all know families like the Red cedars and like the White cedars. So now I ask you, "Whose kids would you trust on your roof?" Q. How much should it cost to hire a professional to install my shingles? A. have found, in general, that the middle of the country seems most reasonable - which is probably true of many situations. The East and West Coast seem to come in a bit pricier. East Coast shingle installation seems to be about the same all over. West Coast pricing, however, has been a whole different education for me! I have found my outliers on the West Coast! Without mentioning names, I was handed the most outrageous bid ever from some guy in Berkley, California. He wanted $500 per square foot! Good Night, Berkley dude! Perhaps there was some reality that surrounded that particular bidder, but he was untouched by it from what I can tell. Granted, I don't claim to understand the economy or logic of Berkley, and perhaps there is a good reason for gross over-charging in that town, but I would advise anyone with a price like that to shop around, like in the Midwest. A good way to put the price of installation in perspective is to remember that it takes about two to three hours of labor to install a square of cedar shingles. It will take longer, most likely, in Berkley, or if no one shows up for work at all.